Bob and I enjoyed a lovely night out at the University Club. I know I have spoken of the University Club before here, here, here, and here but it is really our go-to place to celebrate our life's special occasions. Bob and decided to celebrate our Valentine's Day with the University Club and I am so glad we did! 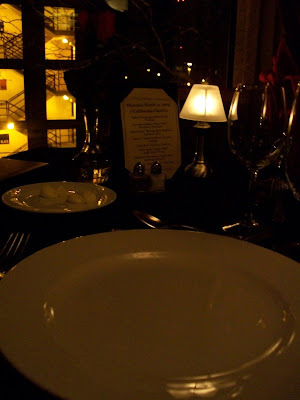 It was one of the best meals we have had (one of our top ten!). Our server, Amy, was delightful. She was informative, fun and efficient. We were served our starter which was a chicken terrine. Then we were served our second course, for me, Maryland blue crab and avocado salad and for Bob, oysters rockefeller. Then I had lobster bisque and Bob had a pear, spinach adn endive salad. Our intermezzo was passion fruit sorbet. Our main course was for me, baked stuff free range chicken breast medallions served on homemade tagliatelle pasta with baby artichokes and asparagus. The sauce was a chardonnay and truffle cream sauce. Outstanding! Bob had tenderloin of beef and herb and garlic crusted veal with falfannese potatoes (sliced potatoes baked in cream). For dessert we both had the trio, which ws a mini creme brulee, a mini blackberry bavarian cream, and a triangle of chocolate espresso flourless torte cake. Bob ordered a wine flight, which means he received a four ounce pour of different wines for each course. For ordering the wine flight, he received four custom made truffles. At the end of the meal, we were given two handpainted caramel truffles. We shared one and brought one home! It was a totally wonderful experience. Sounds like a perfect evening for a great couple!! Terri, what a wonderful experience. You both are sooo adorable. So glad you had a lovely evening with your Honey!! What a great place for a Valentines dinner. Sounds like you had a great evening. Sounds like you had a beautiful evening! The food sounds just scrumptuous! Now THAT is my idea of dining out! I am so needing a fine dining experience now. Wait...I took out hamburger, humpf! Oh my goodness!!!! I am in Valentine's Day dinner envy! That wasn't a meal...it was a vacation!!!!! You both look so wonderful. I love to see love on the faces of people who really know what commitment is. Beautiful! That sounds like such a classy way to spend a romantic Valentine's evening! Everything sounded so delicious, too! What a perfect night out Terri. You two look just so gorgeous too! Just here catching up with you!